How many of the book covers can you identify? You have a week to identify all 20 book covers. Full sets of Moo cards up for prizes. Entry forms in the library, see here for the full set. Each day in advisory 5 questions will sent to your advisory teacher, the first advisory to complete the google form on each day will be the winners for that day! 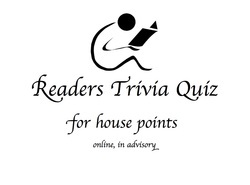 House points will be awarded for the winners on each day and for the overall winners! Come to the library and have a go at creating short poems from the spines of books ... haiku, rhyming, nonsense, riddles, funny ... it is up to you! Photos will be taken and your creations displayed. We have two booksellers bring their stores to RCHK, and you will have the chance to visit them over two days. 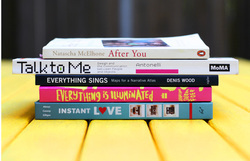 Bring your cash to buy on the spot, or place an order for your favourite book to be delivered within a few days. 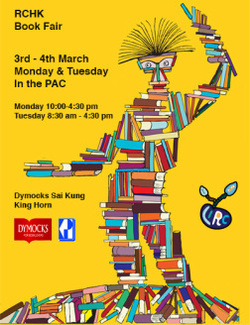 Dymocks and King Horn will be happy to serve you at the book fair. 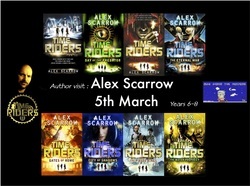 Come and hear fabulous tales of riding through time with Alex Scarrow's interactive talks. Alex's books will be available to purchase for $110 each or 3 for $300. 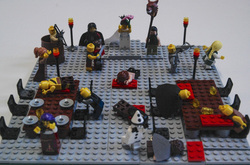 Lego will be provided in the secondary library for you and a few friends to come along and create a scene from a book. You creations will be photographed and displayed! 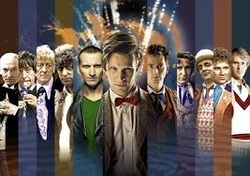 Come to school dressed as your favourite character from across the universe, please leave your intergalactic weapons at home!! Do you have books at home that are not in english? Would you like to donate them to the school library to help build our Mother tongue collection in primary and secondary? Bring them in and let us share them with others.